The villa in Ibiza, with the illegal chill-out area on the waterfront below. The owner of a luxury villa in Ibiza is in hot water for creating a chill-out sundeck on public land on the waterfront below his home. On a rocky stretch of shorefront near Ibiza’s Comte beach in Cala Conta, the owner of a swanky villa on top of low cliffs overlooking the water is in trouble with the authorities for setting up a private chill-out area with a bathing deck on public land, reports the local paper Diario de Ibiza. Several members of the public have also reported the owner, who is said to be Russian, to the Guardia Civil police after private guards tried to scare them away from the area, where the public have right to be. One person who called the police about harassment said the owner made off in his yacht before the police arrived. The White Island’s Councilor for the Environment, Miguel Vericad, was also reportedly intimidated by private guards when he visited the site. The Guardia Civil have confirmed the chill-out and sun deck is located on public land, where everyone has the right to go. 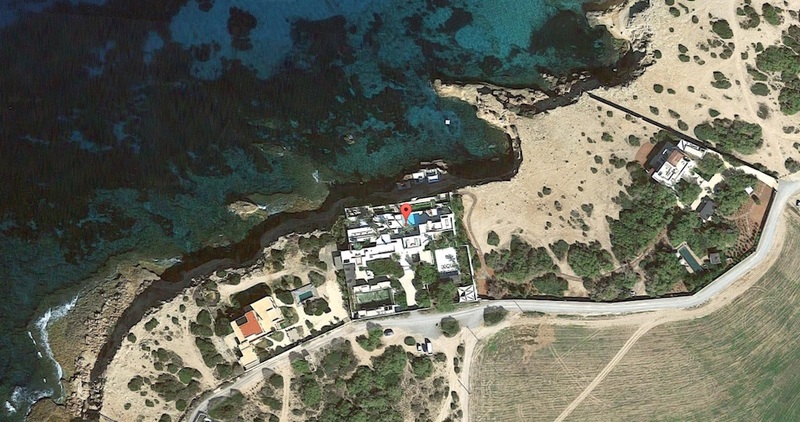 The Consell de Ibiza, or Island Council, responsible for running the island, has reported the owner of the villa, where supermodel Elle Macpherson used to stay, to the coastal department and public prosecutor for unauthorised occupation of public domain. The entire waterfront in Spain including beaches, dunes and other coastal features were nationalised by the Ley de Costas of 1988, which has been causing problems for thousands of property owners ever since. Foreign buyers are also caught up in the drama, as I explained in my article Too Close to the Edge. When buying property in Spain close to the waterfront, always have a lawyer check out the Ley de Costas implications before you go ahead with the purchase. And if you buy a home on a rocky shore that is hard to reach, don’t assume you can create a private chillout on the waterfront, however inaccessible it may be to others.